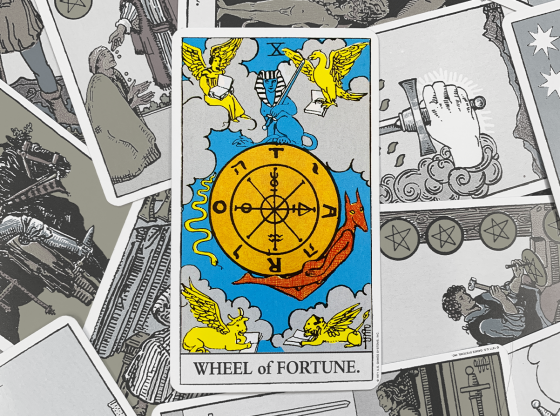 There are six cards in the Tarot deck with the number two on them. They are each distinct and might seem to have little in common, but they are united in their reflection of certain themes. 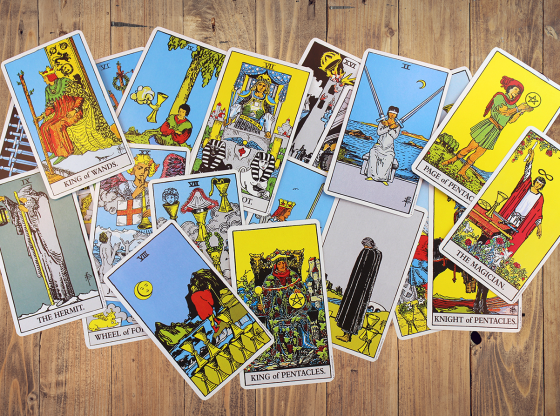 The Tarot’s pair of Major Arcana cards with the number two are The High Priestess card, numbered 2, and The Hanged Man card, numbered 12. 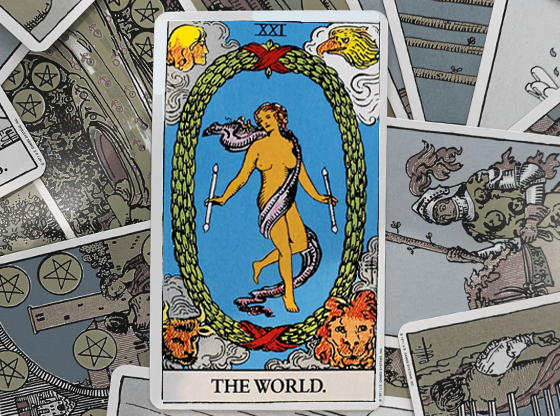 Each of the four suits of the Tarot’s Minor Arcana (Wands, Cups, Swords and Pentacles) also has a card numbered two. The themes of each two card can be summarized as patience, balance, extremes and the struggles inherent in these processes. Patience can be the path to a great reward or a higher consciousness, but it can also produce a boredom that inspires apathy if not self-destruction. Balance can bring you a life of rich diversity and dynamic possibilities, but it is also requires loads of work and time to take care of the many details that build a life. Extreme positions are often necessary in order for you to establish your identity and stake out who you are and what you value, but there is a lot of isolation when you are out on your own in an extreme state. 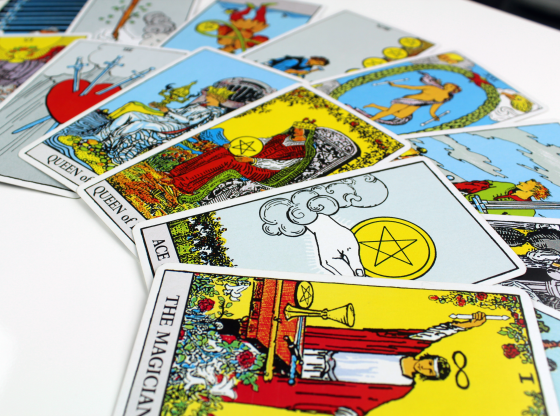 When a card with the number two appears in your Tarot reading, these themes are about to come up in your life if they have not already. If more than one of these cards comes up in the same reading, this energy is palpably near the surface and very influential in your life. The High Priestess is the highest-ranking two card in the Tarot. As glamorous as her title may appear, understand that she is not royalty. She has earned her position by balancing knowledge with wisdom. The process has of course required great patience on her part. This manifests as a cool nature that is not inherently giving. She provides her expertise and the objectivity that she has accrued when she is called into action, but she is not a helper. The years of experience that this card represents underscores a patience that makes one think of one’s self first. This extreme behavior sets her apart in exclusivity, perhaps even fame, but it also sequesters her from immersion in a pleasurable life. When The High Priestess appears in your reading, your need to seek out a solution to imbalances may isolate you as others feel you are behaving selfishly. 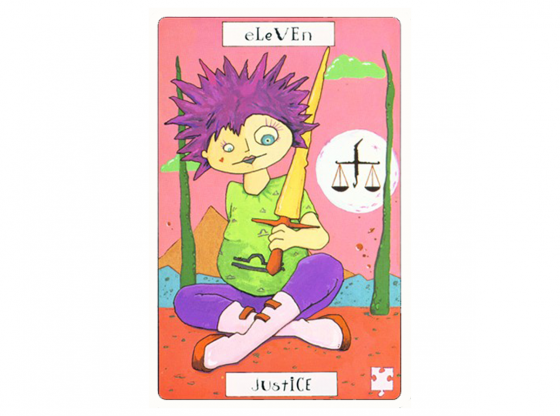 The Hanged Man, numbered 12 in the Tarot, is the Major Arcana’s other card with the number two in it. The pathetic nature of this card is apparent first and foremost. How could a card with such a dismal figure in it be considered a Tarot relative of the mysterious and elegant High Priestess? They have so much in common if you look just beneath the surface. The Hanged Man chooses to be in this position. This is the card of holding yourself back. The Hanged Man’s self-restraint is akin to the jaded apathy of The High Priestess. She must be beckoned before she will help just as The Hanged Man will wait for something to care about to come along before he extracts himself from his situation. 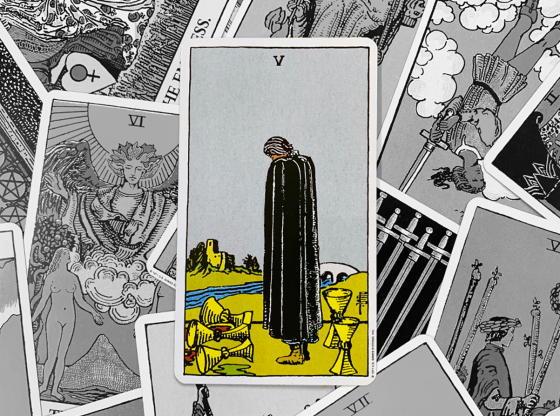 If The Hanged Man appears in your reading, you are biding your time, possibly out of patience and understanding, but perhaps out of spite or a defeatist attitude. The number two graces four of the Tarot’s suited cards; these are also known as the Minor Arcana. 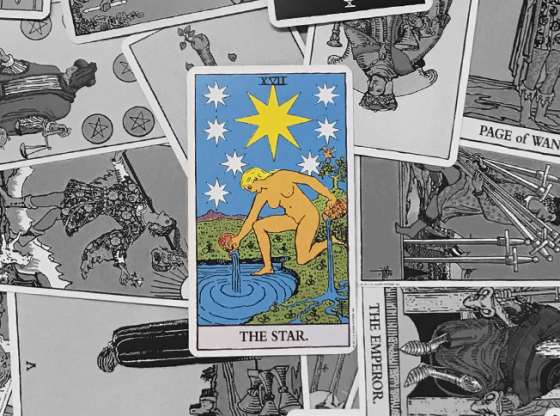 These cards all carry the themes of their Major Arcana, but when only one of these appears in a reading, this energy is peripheral to the big picture. 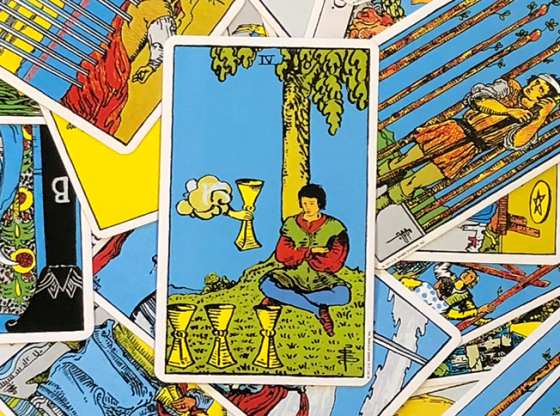 If two of these cards pair up or accompany The High Priestess or The Hanged Man, the concerns of the Tarot’s number two are heightened to the point that they are central to your reading. The theme of patience is shown in the Two of Wands as a man rewarded for his work and creativity. He holds a globe and knows that he has made his own way in the world. The balance of a good life with an obviously secure, yet comfortable patio setting, does not exclude him from being a man of the world, revealed here by the oceanfront setting. There are extremes that need balancing in this calm setting: His physical presence dominates the card, but staring at the globe, his mental concentration is in the realm of imagination. 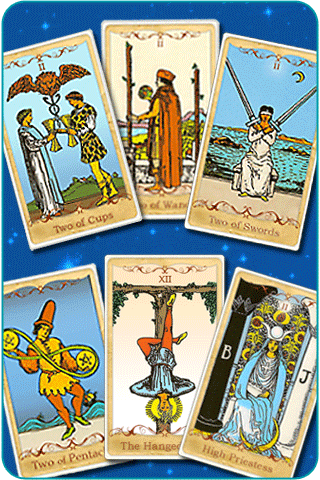 The Two of Cups is the only card of the Tarot’s number two cards that has more than one person. Here two friends exchange cups and illustrate that interpersonal exchanges are what balance one’s emotional life. The stability and pleasant nature of this card is not without the extremes of an illusionary winged lion’s head floating above this pair. That they are oblivious to this echoes the distance of The High Priestess and the apathy of The Hanged Man. Their moment of union and friendship is privileged no matter how extreme the visions are out there in the world. Although the woman pictured in the Two of Swords is blindfolded, note the precise balance with which she points her swords. The equilibrium she has achieved is the victory, as her swords, representing ideas and words, are perfectly balanced. Her blindfold echoes the distance created between her and other people. The extremes of being blindfolded are almost an illusion as the crescent moon sheds little light in the night – like The Hanged Man, she could remove the blindfold any time she wants, but like The High Priestess, she prefers to keep it on and embrace the extremes of mystery. The Two of Pentacles illustrates the theme of balancing extremes. A man in a funny hat is on solid ground while the ocean rocks back and forth, and yet he is not content to simply hold on to what he owns. 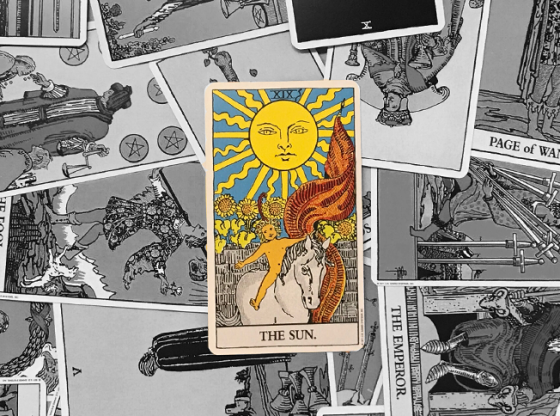 He juggles his pentacles in an infinite dance, enjoying the extremes and perhaps even being risky with his otherwise secure state in the world. This energetic behavior is a reaction to boredom; what manifests as patience in other cards with the number two is no longer here. In its place is a contentment of living in the moment where everything hangs in the balance because nothing is secure. 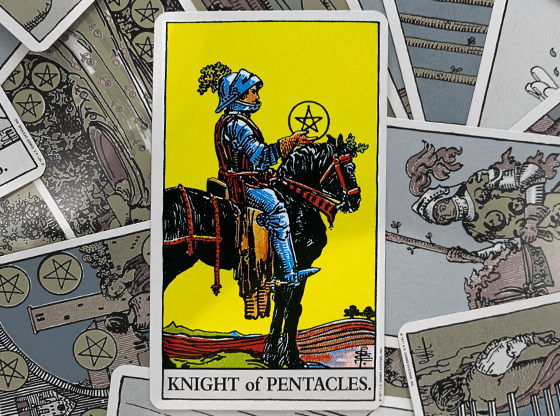 The Two of Pentacles reveals that in the extremes, the peace and enlightenment we seek in patient progress is quickly delivered, although it may not be as long lasting.